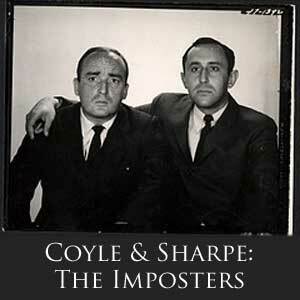 This week, Coyle & Sharpe affect piss-poor French accents and ask an antique dealer if they can smash his goods. This week, Coyle & Sharpe invade a football practice field, where the ask a coach for his help training their wolverines in sport. This week, Coyle & Sharpe as a man from Montana to help them in their agricultural facility. They're looking for someone to control the laborers using guns and electrical shock. This week, Coyle & Sharpe discuss with a New Zealander the possibility of growing an ashtray from his forehead. The ashtray would be sold. This week, Coyle & Sharpe visit the pharmacy, but the pharmacist is upset when he discovers they are planning a home surgery.